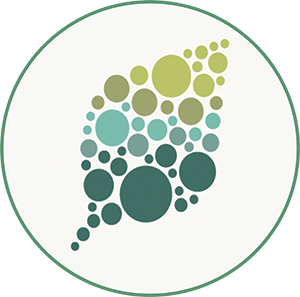 Legumes associate with beneficial soil bacteria called rhizobia to acquire plant-usable ammonia in a process called root nodule symbiosis (RNS). This association is so valuable for nitrogen starved legumes that they form specialized new organs to house them. These de novo organs, called nodules, develop on roots and are the site of nitrogen fixation. Here, rhizobia differentiate, and are provided a hypoxic environment to convert dinitrogen to ammonia in exchange for plant photosynthates (Oldroyd et al., 2011). Nodule organogenesis is tightly regulated; the number, position, and morphology of nodules are controlled by a network of transcription factors. Historically, the first legume mutant in a gene encoding a transcription factor important for RNS was identified in Lotus japonicus and termed NODULE INCEPTION (NIN) (Schauser et al., 1999). Since then, orthologous genes with conserved functions have been identified in many nodulating plants, including the model legume Medicago truncatula (Marsh et al., 2007). In wild-type plants, root hairs curl to entrap rhizobia and form infection pockets in the susceptible region of the root. Simultaneously, divisions are initiated in the pericycle and cortex directly below successful infections, which eventually form nodules. By contrast, knock-out mutations in the NIN gene cause excessive root hair curling across a widened susceptible zone, but infection threads and cortical cell divisions fail to initiate. However, if the NIN promoter region is disrupted, as in the L. japonicus daphne mutant, only nodule organogenesis is abolished and instead the mutants are hyper-infected (Yoro et al., 2014). Curiously, despite efforts by multiple research groups, defects in nin mutants could not be genetically complemented in full by an intact transgenic copy of NIN. That is, until now. In a milestone study, Liu et al. describe findings that finally shed light on this long standing mystery. Using a novel fast neutron deletion mutant allele of M. truncatula nin called daphne-like, they identified ten Cytokinin-responsive promoter Elements (CE) in a region 18 kilo-base pairs upstream of the translation start codon. These CE, which are conserved in at least eight legume NIN promoters, appear to be essential for initiating cell divisions in the root pericycle, leading to formation of nodule primordia. This remote location of key cis-regulatory elements potentially explains why previous attempts using the partial NIN promoter in both Medicago and Lotus could only restore epidermal infection events in nin knock-out mutants. The authors further dissect the NIN promoter and reveal that it is roughly modular; NIN expression driven by up to 2.2 Kb of the promoter can rescue excessive rhizobia-responsive root hair curling and infection-pocket formation, while 5 kb can restore defects in infection thread development. The fusion of only the remote CE element to the 5 kb native promoter, or even to a minimal –46 bp CaMV 35S promoter, was sufficient for complementing nodule organogenetic defects in the M. truncatula nin mutants. The authors then demonstrate that rhizobially-induced expression of NIN in the epidermis perpetuates its own expression in the pericycle via a positive feedback loop. 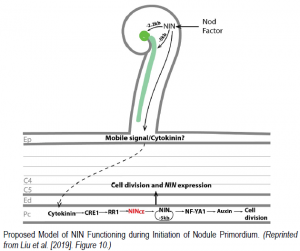 They conclude by suggesting a model in which a yet unidentified Nod-factor responsive mobile signal generated in the epidermis causes cytokinin accumulation in the pericycle. Cytokinin signaling components such as CYTOKININ RESPONSE1 and RESPONSE REGULATOR1 further activate CE-dependent NIN expression in the pericycle. This additive increase of NIN threshold levels presumably leads to accumulation of auxin and ultimately cell divisions that lead to nodule primordia formation. This study conclusively ends a twenty year long search for a promoter to complement the nin mutant and sets the ground to further explore the role of this central player in RNS. Marsh, J.F., Rakocevic, A., Mitra, R.M., Brocard, L., Sun, J., Eschstruth, A., Long, S.R., Schultze, M., Ratet, P., and Oldroyd, G.E. (2007). Medicago truncatula NIN is essential for rhizobial-independent nodule organogenesis induced by autoactive calcium/calmodulin-dependent protein kinase. Plant Physiol. 144: 324-335. Oldroyd, G.E.D., Murray, J.D., Poole, P.S., and Downie, J.A. (2011). The Rules of Engagement in the Legume-Rhizobial Symbiosis. Annu. Rev. Genet. 45: 119-144. Schauser, L., Roussis, A., Stiller, J., and Stougaard, J. (1999). A plant regulator controlling development of symbiotic root nodules. Nature 402: 191-195. Yoro, E., Suzaki, T., Toyokura, K., Miyazawa, H., Fukaki, H., and Kawaguchi, M. (2014). A Positive Regulator of Nodule Organogenesis, NODULE INCEPTION, Acts as a Negative Regulator of Rhizobial Infection in Lotus japonicus. Plant Physiol. 165: 747-758.